Photo courtesy of AP Photo/Chris Szagola. 39. Read it one more time. Thirty-nine. That is the amount of wins the St. Louis Rams achieved from 2008 through 2015, the eight seasons in which former second overall pick Chris Long was on the Rams roster. Long even played in 102 straight games from ’08 to ‘14, until an ankle injury cut his season short in 2014. Long played his last season with the Rams in 2015, before being cut once the team packed their bags to head west. But back to 39. That is how many games the Rams won while Long was on the team. Long has since played with the New England Patriots in 2016 and is now with the Philadelphia Eagles. Between Long’s regular season and postseasons in 2016 and 2017, Long has won a whopping 32 games and only lost five. Talk about change. Here is something else pretty noteworthy, Long was a member of the Patriots last season, and was a key defensive factor in the biggest comeback in Super Bowl history, in a 34-28 win over the Atlanta Falcons in Super Bowl LI. After nearly a decade of being apart of several bad Rams teams, Long hoisted the Lombardi Trophy. Long reacts after the Patriots get a key stop in the 4th quarter of their comeback in Super Bowl LI. Photo courtesy of John David Mercer/USA TODAY Sports. One year after winning the Super Bowl LI with New England, Long is now playing in Super Bowl LII as well. This time, it is against the team he won it with. Long and his teammate LeGarrette Blount are the first players in NFL history to make it to back to back Super Bowls each with a different team. Long, at the ripe age of 32 years old, has not been a starter for the Eagles this season, but his impact has been felt throughout. Long only started one game but saw snaps in all 16 regular season games. He racked up five sacks and forced a career high four fumbles. Long has played in both of the Eagles playoff games this season, and had two tackles, two passes defended, and a fumble recovery. 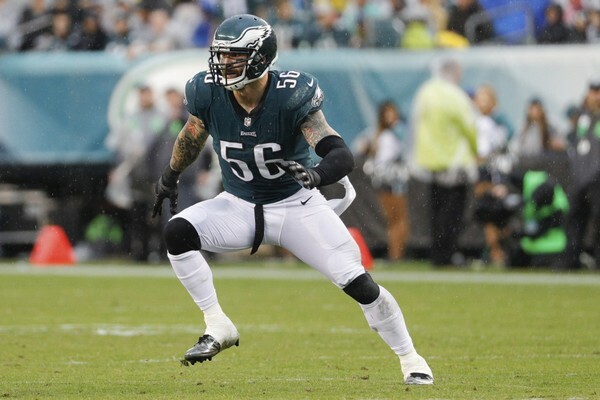 When you look at Chris Long’s story as a whole, it is incredible. The guy was a bright spot on the Rams defense for a team that was mediocre year in and year out. Long has also done everything right off the field and has even gone out of the way to do so. I would have to write a novel to cover every single charitable and humanitarian thing that Long has done off the football field. From helping and giving to the homeless, youth programs across the nation, our nation’s veterans, and even helping get clean water to the people of Africa, Long has really done it all and continues to do so. To this day he still gives back to the St. Louis area in terms of educational equity and opportunity. The NFL may want to forget about St. Louis but Long certainly has not. Photo by Jasen Vinlove/USA TODAY Sports. Most notably, Long has and will continue to donate every single bit of his salary earned in the 2017 season, with the money going to a different charity every week. Upon the announcement, Long stated “I hope it won’t stop here, but that more people will become inspired to commit energy and resources to our educational system. It will be the number of people invested in this cause that will be the difference maker for a quality education for every student in America. Education is the best gateway to a better tomorrow for EVERYONE in America.” Not to undermine any other nominees, but it is insane that Long has never been a finalist for the Walter Payton Man of the Year award. Long recently teamed up with Eagles teammate Lane Johnson to create a shirt detailing Long and Johnson on the shirt in their acclaimed dog masks, as they have embraced the underdog role this postseason. All sale proceeds went toward Philadelphia public schools. Long even had separate shirts designed through Waterboys, his clean water initiative in which all proceeds went to efforts to provide more clean water for those who do not have access to it. I bought one myself, and it turned out terrific. Undoubtedly, Long is utmost deserving of where his football career has taken him. From being the second overall pick, laying it all on the field day in and day out for several years on a team that always seemed to be in the rebuilding stage, to winning a Super Bowl, and now competing to win a second consecutive one. Long is exemplary of how a professional athlete should use his platform to improve the world around him. We hope to see many more follow in his footsteps. To close, I would like to say this: Thank you, Chris, for giving us all you had in your eight seasons here in St. Louis. Thank you for using your own energy and resources in order to benefit those around you, and even for those who do not know you. Bring home your second Lombardi. The St. Lunatics have your back and always will. Let’s go Eagles! College kid who is a crazy sports fanatic for the teams in St. Louis.